Yesterday was a big game, or so I heard, and maybe you’re craving some greens after all those game day snacks. Or maybe you’re still craving those salty game day snacks but are thinking you really need to eat something a little healthier. 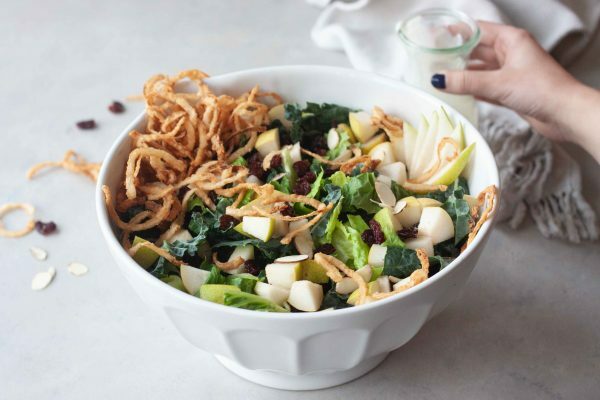 No matter how you’re feeling today this Winter Pear and Cherry Salad is one to consider. Salads are so underrated if you ask me. I don’t know how many times I hear people talk about boring salads or think it’s crazy if I talk about having a salad for dinner. I get it if you have never had a good flavorful filling salad I can see how you think they’re boring or just meant for a side or before a meal. I have a few criteria when it comes to salads. They have to have texture, flavor, and nutrition and this one checks all the boxes and then some. Two kinds of greens, really packing in the nutrition with kale and romaine hearts. Fresh juicy pears and tart dried cherries, more nutrition but just think about those flavors. Don’t worry though this isn’t a sweet salad it’s balanced out with salty and complex flavors of crispy onions and blue cheese. Oh and some almonds for crunch. If your mouth isn’t already watering at all those flavors I don’t know what else I could add. I will say this isn’t the healthiest salad but it’s a good one and there still is nutrition packed in. If you want a healthier option you can omit the crispy onions. For the dressing you just need enough to coat the greens and this isn’t one that you dump a lot of heavy dressing on despite it being a heavier dressing, a little goes a long way. 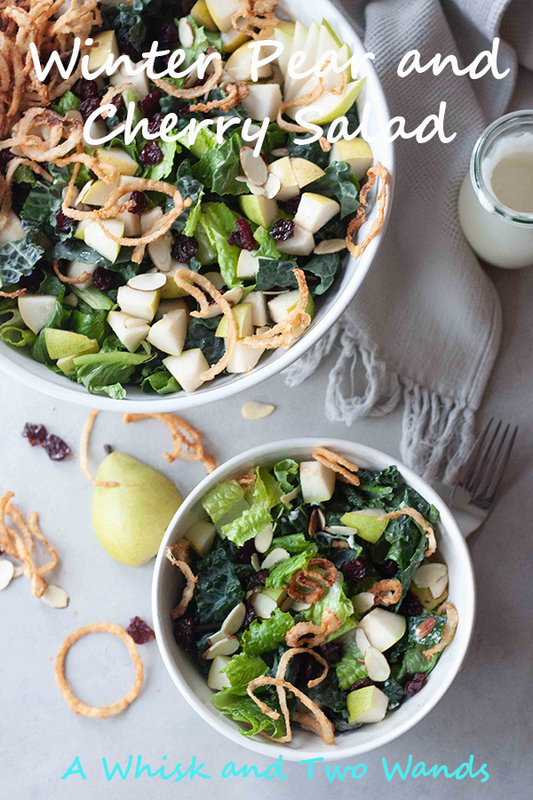 This Winter Pear and Cherry Salad is a salad that can be served as a meal or part of a meal. 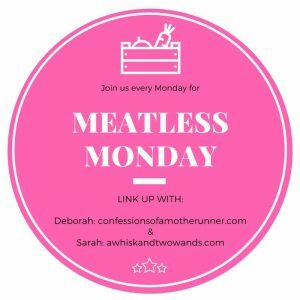 Think you can’t get your man or family to eat a salad for dinner, think again! Although if you’re kids are like mine, or you aren’t a fan of blue cheese, you can leave that off. Blue cheese is one of my biggest, and CRAZIEST, pregnancy cravings. There are bottled dairy free/vegan ones and I’ve tried to make a few of my own dairy free ones but I’m not going to lie there is a little something missing if you are a true blue cheese lover. I will mention and link to some in the recipe notes below. If you have a favorite you love PLEASE let me know! I figure at this rate I’ll find one I love and then baby boy will arrive and I won’t want it anymore. Making a Valentines dinner at home? Add a smaller version of this salad as a starter. I’d pair it with a dry white wine, well if I was able to enjoy my wine this Valentines. I’d like to think that wine misses me too. Anyone else feel like the year is already flying by and we just celebrated Christmas? In other news for those wondering I’m cleared to workout, listening to my body and taking it easy, so that made my Friday. I have so much to get done before baby boy arrives and he needs to stay put a few more weeks. 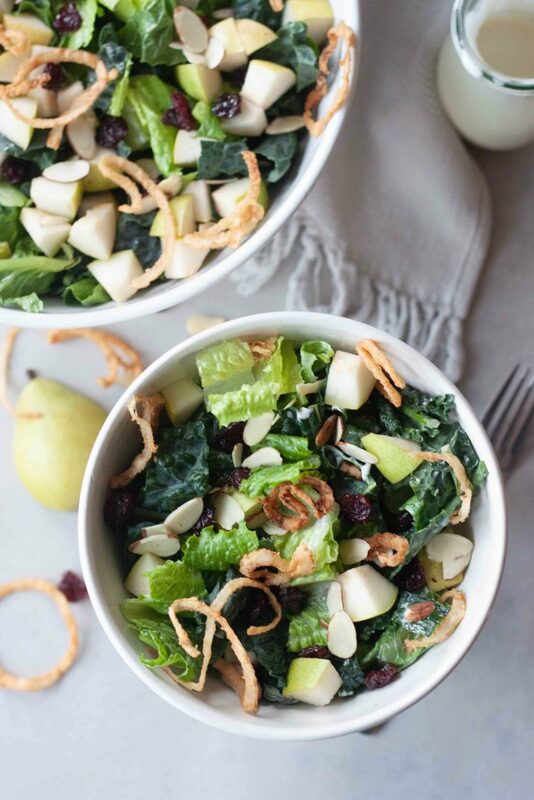 Delicious Winter Pear and Cherry Salad is a blend of romaine and kale topped with juicy ripe pears, tart dried cherries, sliced almonds, and crispy onions. Dressed or served with blue cheese dressing (dairy free/vegan options). Makes a delicious main course or side salad perfect for a weeknight meal or entertaining. Peel your onion and slice as thin as possible. I like to use a mandolin for thin even slices. Separate your onions. In a large bowl add salt and flour. Add your onions to the flour mixture and toss to evenly coat and make sure all the onion rings are separated. Heat oil over medium high heat. If you have an air fryer you can try to make these in there and let me know how it goes, I still haven't bitten the bullet and bought one. When oil is hot grab a handful of onions and shake off the excess flour. Place in the oil, remove once they are golden brown and place on a plate lined with paper towels. Repeat with remaining onions. Chop greens. 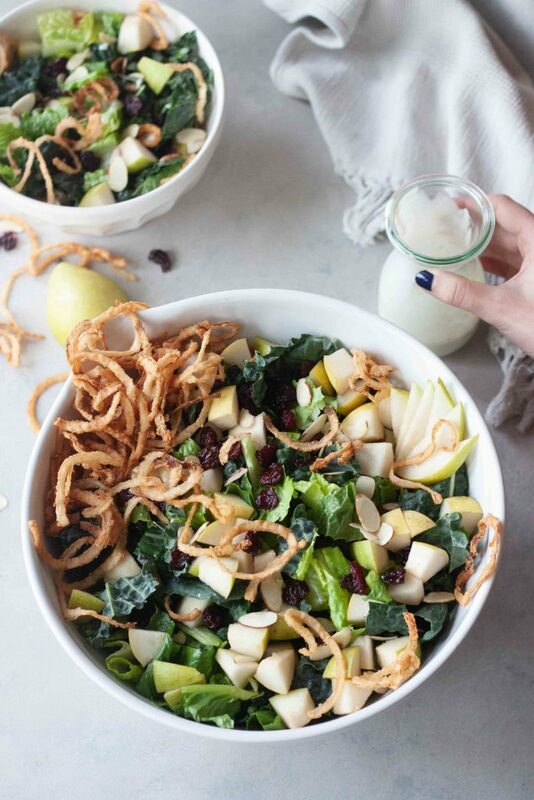 I like to dress the greens with dressing and message in a little to the kale as it will soften it but if there are those that don't care for blue cheese I just skip this and serve the salad with blue cheese. Slice pear in half and remove core, slice into slices or you can chop into smaller chunks. 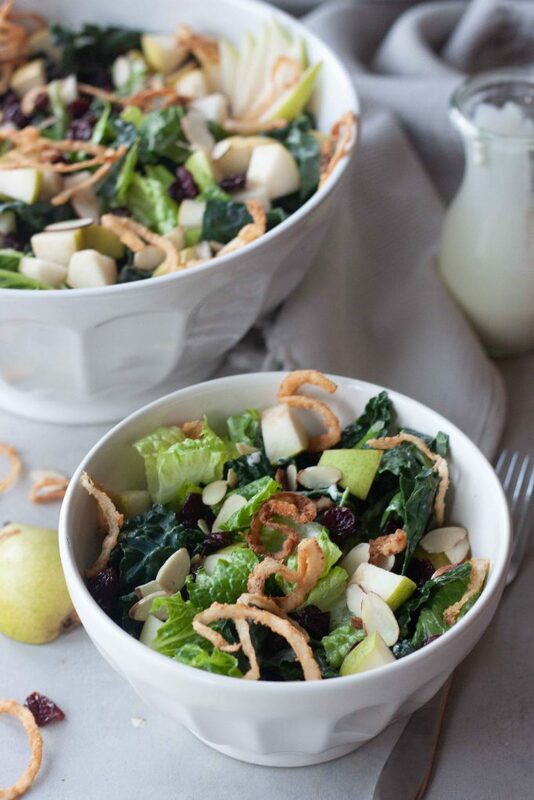 Top greens with sliced pears, dried cherries, almonds, and crispy onions. There are a few dairy free/vegan blue cheese dressing options. Some big label ones you wouldn't realize as well as Daiya. If dairy free/vegan isn't needed your favorite blue cheese dressing can be used. I'm still trying to perfect a Dairy Free Blue Cheese using the tofu crumbles I like but here is a basic one I've been tweaking but as stated in the post it isn't the same as real blue cheese. 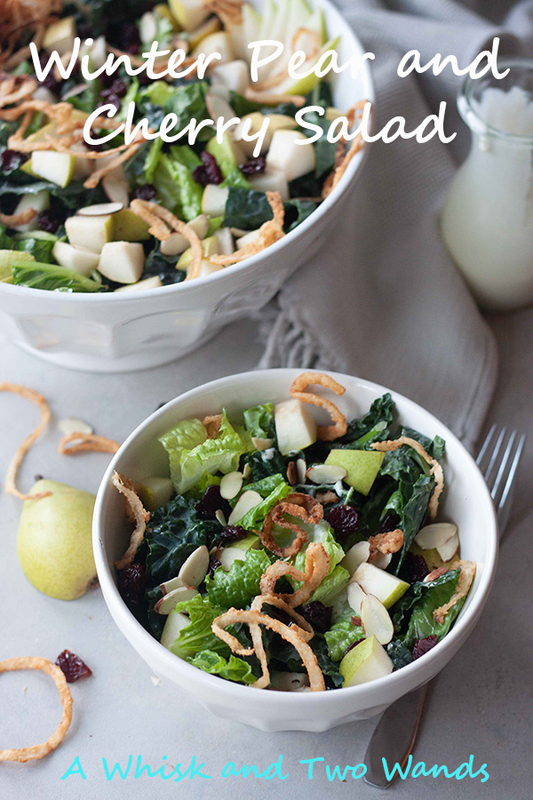 I was just looking at another recipe that included cherries and was thinking, “Mmmm, I need to buy some cherries ASAP!” I’m with you about salads – They can be so versatile and the possibilities are endless. I think that people are just used to the same few boring salad combos. Last night I made a spinach salad that included farro, avocado, cherry tomatoes and cheddar. So good!